Because the fruits can get so large and heavy, tomatoes are one of those plants in your vegetable garden that require some form of trellising or support. Trellising keeps the plant upright and prevents the stems from breaking during any high periods of wind. It’s also important to trellis tomatoes so that you keep the plant leaves off the ground, which helps to reduce any possible plant diseases that may develop from excess ground moisture. From our experience, the two most effective tomato trellising techniques are using sturdy, square cages and using twine weaved between plants. We use both techniques in our garden, but for different situations. Using cages to trellis tomatoes is a great technique for several different situations. If you grow 10 or less tomato plants, cages are probably the most feasible option for you. 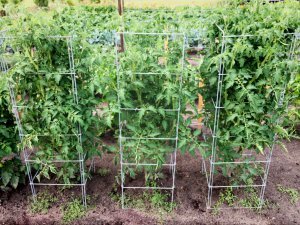 High-quality, square tomato cages provide support around the entire plant. They are easy to install by simply pushing them into the ground over the top of young tomato plants, and these sturdy cages are galvanized and made to last for many years and gardens to come. Cages also work particularly well for large, indeterminate varieties such as Roma or Yellow Pear. For these varieties, the plant will grow continuously throughout the warm season until it is removed or killed by cold temperatures. Because of the increased plant size, taller cages work best to support these massive plants with such a large bounty of fruit. The other proven option for tomato trellising is called the “Florida Weave”. This technique consists of using stakes along the row and weaving twine between the plants and each stake. 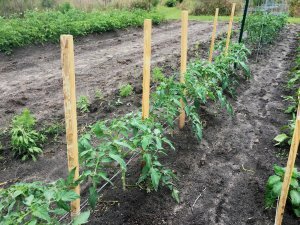 The Florida Weave is a great way to trellis tomatoes if you grow many tomatoes along a row. In this case, the number of cages required to support each plant might not be feasible, so the twine trellis makes more sense. We use metal t-posts and wooden stakes along the row, then weave twine around the plants and posts to support the plants. You can use cotton twine or commercial-grade, polymer twine to trellis tomatoes using the “Florida Weave”. In addition to being a great option for large growers, this option works great for determinate tomato varieties that have a limited lifespan. Check out the video below where we show you how to do the Florida Weave technique.